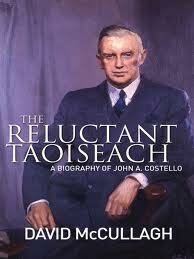 The Reluctant Taoiseach – a biography of John A. Costello. Gill & Macmillan, 2010. David McCullagh, pp 530. Photos. I bought this signed copy of Costello’s biography at the launch of the book at the Mansion House. David McCullagh had already published a book on the first Inter-Party Government in 1998 entitled A Makeshift Majority. A History of the first Inter Party Government, His new book is a long read but is clearly well researched and gives a detailed, favourable and well-balanced account of his subject. It is an important contribution to the history of the neglected early years of the State including the 1940s and 1950s. It is of particular interest to me because of my father’s seminal part in setting up the inter-party government and in leading Fine Gail out of the doldrums after his election as President of the Party in 1944. Costello may have been a reluctant Taoiseach but once he became the head of the government he retained his dominance both in government and in opposition from 1948 until my father resigned as President of Fine Gael in 1959 and James Dillon became head of the Party. Costello as Taoiseach, surrounded as he was by a disparate cabinet membership from five different parties, was soon to depend on only a few figures to advise him and to guide him in leading the combined parties involved in both governments 1948-1951 and 1954 -1957. His chief political intimates were Billy Norton and James Dillon and his close personal advisors were Paddy Lynch and his son-in-law Alexis Fitzgerald. My father, despite remaining head of Fine Gael and despite his long friendship with Costello, retired to the shadows of the Department of Education in Marlborough Street, and characteristically showed his loyalty to Costello’ leadership by remaining very much in the background. It was characteristic of my father’s modesty and lack of interest in personal power that he remained remote during the two parliaments from Costello and his principal advisors. I have always been critical of my father’s failure to oppose Costello’s decision to leave the Commonwealth without consultation with him and his party and I believe that Mulcahy’s failure to maintain his stated commitment to the Commonwealth was caused by his reluctance to endanger the stability of the government and to thus allow Dev to return to power. His sojourn at the Department of Education seemed also to impair his very active organisational role as head of Fine Gael, which was so evident during the 1944-1948 periods. 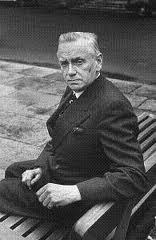 Later he .was to become a force in defending PR when it was threatened by De Valera in 1958 and he showed firmness when, on his retirement as President of Fine Gael and despite his support of Costello’ as his successor, he refused to support Costello because the latter refused to take the leadership in a full time capacity. Mulcahy was only too aware that, whatever merits Costello had as a politician and parliamentarian, his attendances in the Dail left much to be desired during his pre-inter-party days and his terms as leader of the opposition between the two three year periods 1951-1954 and 1957-1959. During these periods Mulcahy continued his regular attendance in the Dáil and largely acted as Costello’s substitute although as head of Fine Gael he might be expected to be the leader of the opposition. Costello had returned to his busy Bar practice and only attended the Dáil on special and important occasions. It was typical of dad’s modesty to stay put in the background. McCullagh was fair in his account of Costello’s personality. He was prone to blunt and plain speaking when he became angry. To the casual acquaintance, such as myself when I met him socially he appeared a rather gruff, impersonal individual of few words which I always attributed a shyness to him rather than a lack of grace but I found eight or more hours confined with him in the back of his Taoiseach’s car to be tedious on our way to the ‘Flatfoot Platypus’ by-election in Donegal shortly after the government’s formation in 1948. I was asked by my father to accompany him to the meeting. We had little to speak about and obviously nothing in common because of our difference in age and profession. The journey proved painful and embarrassing and Costello’s humour was clearly affected by his dislike of electioneering and was not helped by the appalling weather on that long day and certainly not by our rescue by the RIC and their four wheeler when our cars was immobilised in a flood in Fermanagh. When we arrived in distant Milford in North Donegal the meeting was cancelled because nobody dared face the elements on that stormy wet night. A few grumpy words with the candidate and his immediate followers and some refreshments and we had to face the dreary return home. Despite McCullagh’s tribute to Costello’s care of his constituency, electioneering was never Costello’s strong point and his own success as a candidate in Dublin North East was largely thanks to his many supporters and admirers who came to his aid at election time and not to his own devotion to constituency work., I recall at home, where we lived close to his constituency, hearing about the sense of urgency to support his campaign and the sudden rush of constituency activity. Whatever about my discomfort on the Donegal trip, Costello’s day attending the by-election must have been a nightmare for him. His life was the law courts and not the political hustling. the financial burden created by to-day’s huge legal fees. It was said during the forties and fifties that Costello charged three guineas to read a brief. We have good reason to know that the author’s opinion is confirmed of his inherent kindness within his family and friends, and with the less fortunate. De Valera, whilst in opposition during the first Inter-Party government, toured America and some commonwealth countries in an outspoken attack on Britain and the North, apparently to influence the Irish Diaspora and to seek international support for the Irish cause of unity. Dev’s intervention must have proved to be an embarrassment to these countries. Costello was equally outspoken about the injustice of partition and it was to take some more years before Lemass was to take a more rational and effective approach to solving the northern question. There is no doubt that Dev and Costello did more harm than good to our relations with the North. Costello’s hostility was particularly manifested after the British confirmed their support for the North’s status quo as long as the majority there was opposed to change. He might have thought it reassuring that Westminster was willing to think otherwise if the unionist majority were not to last. The chapters dealing with the second Inter-Party government, its failures (it seemed from the beginning to go into a slow decline over its three years), the two periods when Costello led the opposition and the general political problems which existed in the 1950s are valuable contributions to our recent history, particularly to those of us who were witnesses of the time. Other evidence of a slow fission within the Fine Gael parity was evident at this time too with my father’s declining influence and a more radical outlook on the part of the younger members. His successor, James Dillon, was hardly at an age and the appropriate political figure to lead the party to a new, more radical and successful future. Dillon’s opponent for the leadership was Liam Cosgrave but at the time Cosgrave had not yet advanced enough in the party to be the obvious choice.